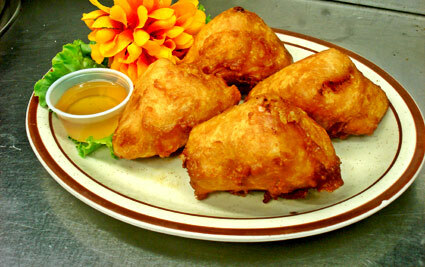 Served with one of the following: French fries, coleslaw, potato skins, mashed potatoes, soup, or salad. The #1 Seller for over 35 years! Layers of thinly sliced ham, turkey and Swiss cheese on fresh bread dipped in tempura batter and deep fried to a golden brown. Garlic bread, melted cheddar and Monterey Jack, deep fried chicken strips, tomato, and hollandaise sauce. An East-coast special! Thin slices of beef quick grilled and smothered with onions and white American cheese. Our quarter-pound chicken fried steak topped with guacamole, sour cream, cheddar cheese, lettuce and tomato served up on a white Kaiser roll. A fresh kaiser roll overflowing with lettuce, tomato, cheddar cheese, tartar sauce and juicy fried clam strips. Grilled chicken breast flavored with ranch-style spices with melted Monterey Jack cheese, tomato, and lettuce. A double-decker sandwich on sourdough bread, combining Swiss, cheddar, avocado, mushrooms, bacon, turkey, sour cream, lettuce and tomato. Roast beef, Monterey Jack and cheddar cheeses, onions, jalapenõs, sour cream, tomato and lettuce all on grilled sourdough bread. Roast beef, cheddar cheese, tomato and lettuce topped with a spicy mustard sauce served up on grilled sourdough bread. 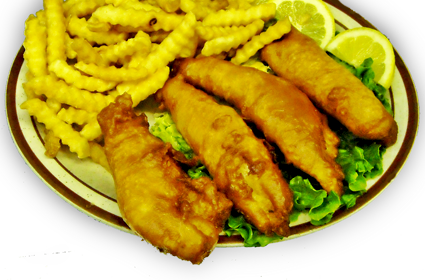 Six ounces of cod dipped in our special batter and deep fried to a golden brown. Served with french fries or your choice of side and tartar sauce. Tender chicken breast marinated in teriyaki sauce and grilled to perfection. Served on a white Kaiser roll with pineapple, lettuce and tomato. Chicken breast, bacon, cheese and avocado dressing on a grilled dill rye bread. Grilled mushrooms, green peppers, onions, tomatoes and zucchini topped with provolone and mozzarella cheeses. A combination of fresh mushrooms, avocado dressing, fresh spinach, tomatoes, cheddar, and Monterey Jack on grilled sourdough bread. Smoked ham, roasted turkey, Canadian bacon, provolone & mozzarella, topped with tomato, lettuce, grilled onions and Ranch dressing. Lean corned beef, Swiss cheese, sauerkraut and Thousand Island dressing on grilled dark rye. 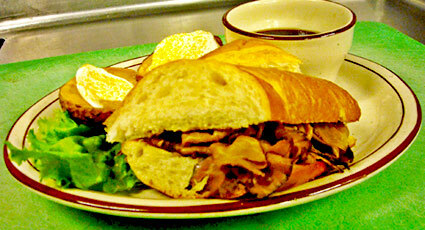 Juicy slices of roast beef on French bread served with au jus. Roasted turkey breast, Swiss cheese, sauerkraut and spicy mustard sauce on grilled dill rye. Roasted turkey, Monterey Jack cheese, guacamole, smokehouse bacon, lettuce and tomato on a warm ciabatta roll. Grilled dill rye, melted Monterey, white American, corned beef, mustard sauce, lettuce & tomato. Charbroiled link sausage smothered with green peppers, onions, red sauce, mozzarella and provolone cheese. Five-cheeses grilled on sourdough filled with a grilled chicken breast, tomato and whole green chilis. 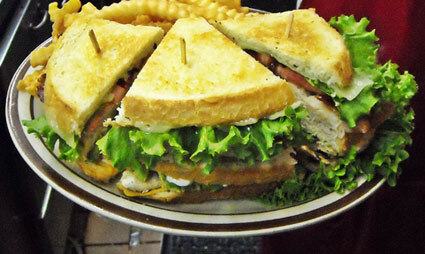 A double-decker: smoked ham, roasted turkey, Swiss, smoke-house bacon, lettuce, tomato and mayo served on toast. Tender slices of chicken quick grilled and smothered with onions, green peppers and white American Cheese.